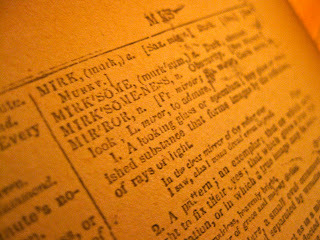 Mirror comes comes Old French mireor (“reflecting glass”), which sprang from earlier French miradoir (exact translation lost) mirer (“look at”) and Latin mirare, miror, and mirari (“to wonder at, admire”). Certainly mirer is the most direct ancestor here; it also gave birth to admire. But let's take it a step further and look at miror, which takes the gentlemanly mirer and proclaims him anemic. Mirer may admire, but miror? To astonish, to marvel at, to be amazed. For comparison, window springs from the Old Norse for “wind eye”; bowl comes from proto-Germanic “a round vessel”; we get desk from medieval Latin’s version of “table to write on”; table itself is from Latin’s tabula, a board or plank; dresser is from...you get the picture. Terms for other common furnishings and items stem from utility or purpose. So either mirror is the exception because of its extraordinary powers—or it’s in the same boat as the prosaic desk, and those old French folk knew that we can’t help but be astonished and amazed by our own reflection. Actually, those old French folk could have just taken the perfectly good Latin word that already existed for mirror: speculum. (Imagine the comedic potential had that happened.) The Italians did just that (specchio), as did the Spanish, Portuguese, and even the Germans (espejo, espelho, and Spiegel, respectively). Speculum also has no-nonsense, utilitarian credentials, springing from specere, or “to look at,” with none of this “astonishment” business coming into play. So why didn’t the French just go with speculum? 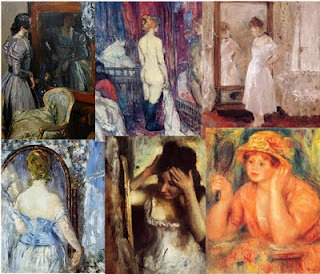 Some posit that the Egyptians beat the Romans to France, bringing along mirrors—and their word for them, roughly mau-her—before speculum-waving Romans had a chance to introduce mirrors to the country that would later become known for manufacturing them. That’s one possibility, certainly. It stands to reason that the French, more than other countries, might have understood that the mirror is not solely for looking. Whether admiration and wonderment is an elevated form of looking at ourselves, or a trap that keeps us eternally monitoring our actions even in private moments, to proclaim the mirror to be only a tool for looking—a speculum—would be a tad disingenuous. Perhaps I haven’t been too far off in referring to the mirror as a divination tool. Historically, alternate uses of mirror include “a crystal used in magic”; indeed, there’s an entire practice of divination via mirrors, catoptromancy (and if anyone knows a practicing catoptromantic, let me know, stat). And, of course, there’s always the verb form of mirror: to mimic, to imitate. We didn’t actually use it to mean to reflect until the 19th century, when Keats put it to use in “Lamia”: He answer’d, bending to her open eyes / Where he was mirror’d small in paradise. In other words, the first time we used mirror to mean reflect, there was not an object, but a human’s eyes, doing the reflecting. Which, truly, makes sense—especially for those of us who have lopped off those “eyes” by averting our gaze from the mirror. But it also might make sense etymologically: One middle form of mirror is old French miradoir, which, as I mentioned earlier, has been lost. Nobody knows exactly what miradoir means. But in this scholarly debate about the full origin of mirror, a linguist broke down the word into verb forms, “Latin agentive suffixes,” etc., and determined that there’s a good chance that miradoir means not just a thing you look at, but a thing that looks back at you. Also worth considering the Arabic for mirror - مرآة - mir'aa. It's a derived noun meaning 'device for looking'. Hi Anonymous--Excellent! I'm wondering if the Arabic and the Egyptian-Arabic are the same, which would post a reasonable explanation for why the French and the French only used this word instead of "speculum"? Archaeologists insist that the mirror was introduced to France by the Romans, but this certainly makes more sense, yes? I wonder if you came across the psychological understanding of why humans and some animals benefit mentally from the use of a reflection. We see it clearly when we observe babies and mirrors. Mirrors teach us many vital lessons about muscle control, eye-hand coordination and most important of all, Our own self-esteem. Without discovering your reflection as a child would be denying yourself to learn and know your relation to humanity. Mirrors have always had high value throughout history. Not many other objects have so many associations with rhyme and stories. Learning and knowing your own reflection builds a child's view of how they fit into their family, their world and quite importantly, it allows them to develop themselves into those all important categories. In cultures without the skill to produce mirrors, the use of water reflection is equally important for normal development. I agree that mirrors have taken an important role in our lives, but I don't know how inherent it is. Plenty of blind people manage to develop just fine--with muscle control, coordination, and self-esteem--and there are plenty of places where access to the mirror is sparing at best (and while one can indeed know what one looks like through water reflection, it's certainly a different experience and not as prevalent as mirrors are for most of us in the western world). I think the mirror can be useful, and I'm intrigued by Lacan's theories of the use of the mirror in psychological development. But I don't want to overstate their utility either.